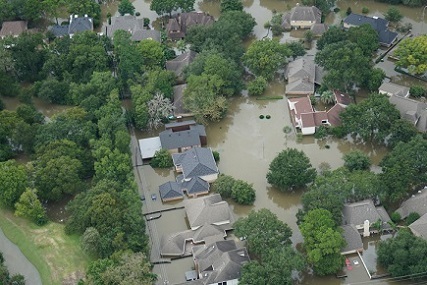 About 386,000 US homes are at risk of climate change-related flooding by 2050 as new-home construction in flood-risk zones contributes to the total, according to an analysis by Zillow and Climate Central. Zillow paired its housing data with Climate Central's climate-science expertise in a new nationwide analysis. The analysis projected the number of new homes — and homes overall — in low-lying coastal areas that will become exposed to chronic ocean flooding over the coming decades. The analysis found that America's coastal communities have recently built thousands of new homes in these flood-risk zones. In New Jersey, 7% of current homes are projected to be in flood-risk zones by 2100, under moderate emissions cuts. However, ongoing development is placing 14% of the state's homes built from 2010 through 2017 in the same high-risk areas. Zillow said that the effects of sea level rise will affect coastal communities in varying degrees. Certain coastal cities such as Los Angeles sit high enough above sea level that the biggest hit will be to their beaches. Others, like Galveston, Texas, and Ocean City, Md., are projected to have 10% and 7% of homes, respectively, at risk of at least annual flooding by 2050 in a scenario where the world makes moderate emissions cuts. "This research suggests that the impact of climate change on the lives and pocketbooks of homeowners is closer than you think. For homebuyers over the next few years, the impact of climate change will be felt within the span of their 30-year mortgage," said Skylar Olsen, Zillow's director of economic research and outreach. "Without intervention, hundreds of thousands of coastal homes will experience regular flooding, and the damage will cost billions."